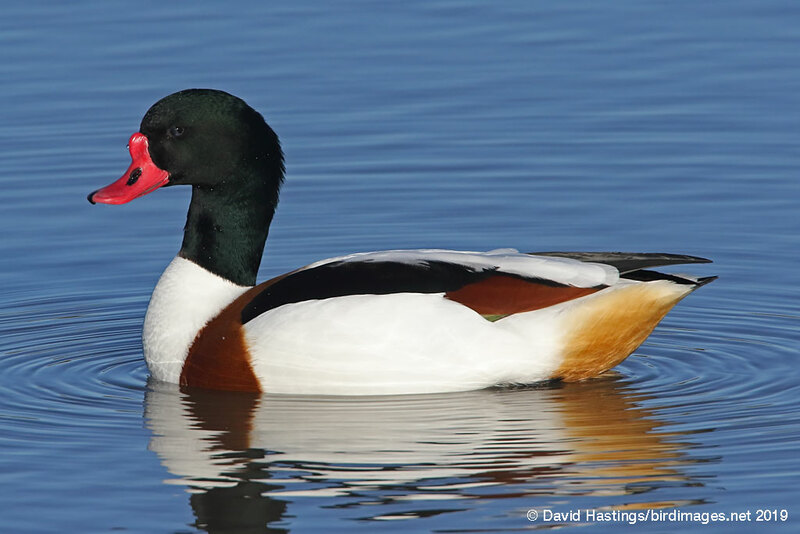 Shelduck (Tadorna tadorna). Male. Taken at Slimbridge, Gloucs., on January 17th 2019. Male. Taken at Slimbridge, Gloucs., on January 17th 2019. Shelduck (Tadorna tadorna). Female. Taken at Slimbridge, Gloucs., on January 17th 2019. Female. Taken at Slimbridge, Gloucs., on January 17th 2019. 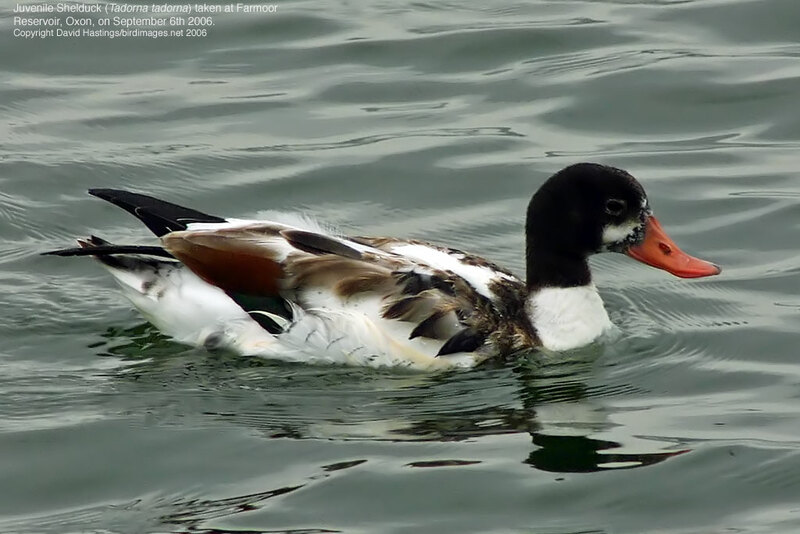 Shelduck (Tadorna tadorna). Juvenile. Taken at Farmoor, Oxon., on September 16th 2006. Juvenile. Taken at Farmoor, Oxon., on September 16th 2006. 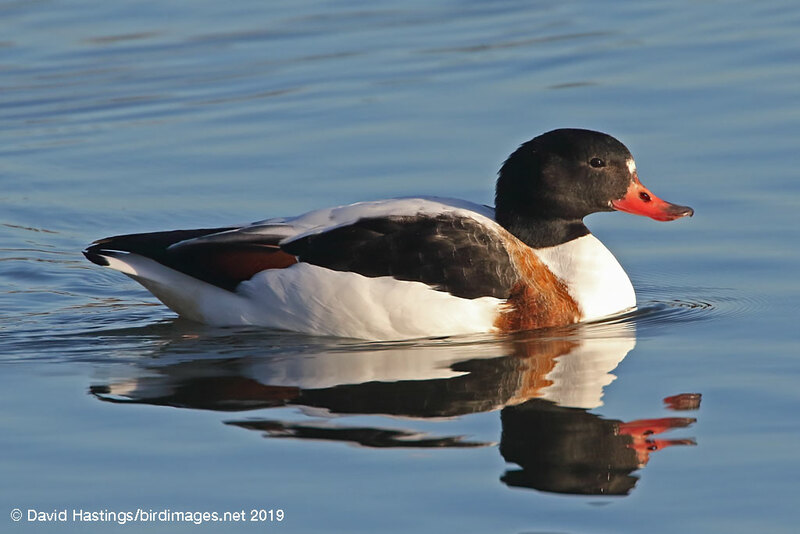 The Shelduck is a mainly white duck, larger than a mallard but smaller than geese. It has a particularly prominent red bill, black-green head, and chestnut and white upperparts. In flight, Shelducks look heavy and have slow-beating wings. The male is larger than the female. The Shelduck is common around the British coastline. It frequents salt marshes and estuaries. It can also be found around inland at reservoirs and gravel workings. As many as 81000 birds spend the winter in the UK. This species has amber status on the UK list.